The last time WTI traded above $70/bbl was in November 2014, three and a half years ago. With trading this morning peaking as high as $69.50, this landmark seems imminently achievable. Crude price gains fell just shy of $2/bbl yesterday, thanks to a strongly bullish EIA report. Today, crude prices are trading firmly higher at $69.03, a gain of 56 cents (0.8%). Fuel prices are also elevated today. Yesterday diesel prices picked up 3.4 cents, while gasoline rose 2.6 cents. Today, both products are continuing to rise. Diesel prices are currently at $2.1122, a gain of 2.1 cents (1.0%). Gasoline prices are trading at $2.0778, gaining 1.0 cents (0.5%). 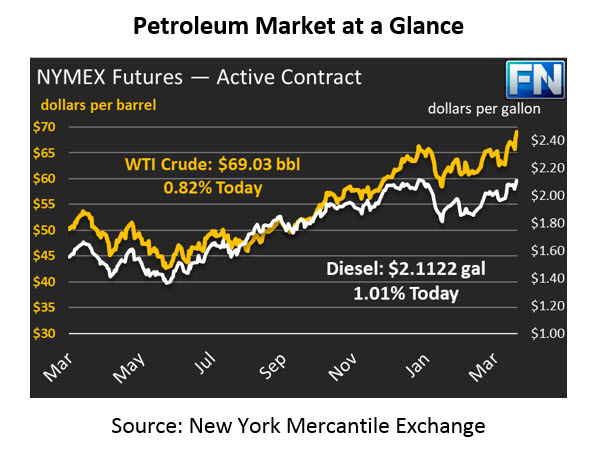 Yesterday’s price rally followed the EIA’s weekly oil data, which showed across-the-board inventory withdrawals. The withdrawals were not a surprise to the market though – oil stocks generally shift around this time of year and begin steadily falling. Markets received a strong boost from gasoline demand numbers, which rose by over half a million barrels per day week-over-week to 9.86 MMbpd. The week’s demand represents a record for April demand, though some analysis groups such as OPIS say export miscalculations may be inflating the numbers. Still, whether used domestically or exported, gasoline supplies are in strong demand, which will keep inventories tracking lower. In turn, this means consumers can expect prices to remain elevated or even lifted higher throughout the summer.